Amanda's begun the new chemotherapy trial and the side effects haven't been too bad so far. Certainly not as pronounced as they were from the carbo-taxol combo last year. 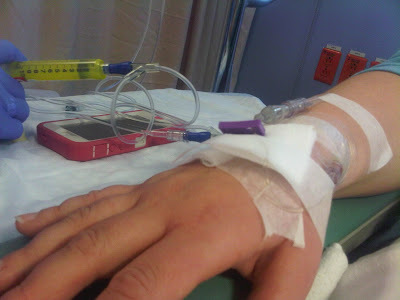 Her veins are pretty bad from all the chemo last time, so they've been having to poke her so many times to find a good place to infuse the drugs. Tomorrow she'll go in to have a port implanted near her collarbone, so the nurses will be able to just stick the needle there instead of having to fish around for the vein. Amanda gets her first dose of the mystery drug....or a placebo. There's some other big news that I'll hold back on for a bit, but it's good stuff. Not cancer stuff, but Big Life Stuff. I want to tell you a bit about something some good friends of ours are doing. We met Greg and Suzanne Morrow when Greg worked with me at News95.7. Greg's a talented broadcaster and one of those superbly nice guys everyone should get to know in their lifetime. The two of them have been welcoming and generous at every turn, the whole time we've known them, even as they've faced personal tragedies in their own lives. A few years ago, they moved to another part of the province, but we've kept in touch. Amanda and I have seen them every year when Greg has run the Bluenose Marathon. Every year, he says it's going to be his last time, but he keeps coming back to do it again. I don't know how he does it. Well, part of it, he says, is that each year he runs for someone close to him, usually someone who's died in the past year. Too many people in Greg's life have died. This year, he's running for us. And he's raising money. We still feel kind of weird about fundraising. We're proud, hard-working people and have never felt like charity cases. But we know people really, really want to help, and this is one way for people to help. It's certainly not something we'd ever *ask* for, and we've even turned down some offers. "Initially, this made Scott and I uncomfortable and honestly, it's still quite overwhelming," said Amanda on Facebook. "We've always been very independent and believe hard work pays off. My career has often had me working with people living in real poverty, unable to feed their families. So, to accept other people's monetary support is still very new and strange to us. We've opened a special bank account and have been setting all funds raised aside for Gordon, hoping we won't have to dip into it to fund the next year or so. My wish is that this fund will allow Scott and my family to further enrich Gordon's life with activities, travel, education, etc.."
Some great people have raised funds for us -- my co-workers had an event, Halifax photographer Shannon Bower and her clients have been overwhelmingly generous, a local cloth diapering group raised money last year, my sister Shannon has been doing a Tupperware fundraiser in Ontario ... and now our friends the Morrows are giving 'er. We've stashed the funds in a savings account. Gordon's life is going to be different. His mom's going to die, probably before he's even able to talk. The money is intended to help give him some memorable experiences and round out his young life. We've been treating those funds with great respect. We know people have given with their heart. I invite you to head to the Giv'er for the Simpsons Facebook page to read more from Greg. We thank them, and you.